Editor’s Note: This interview has been edited and condensed. It is part of The Beat of 24th and Mission. Stella Adelman voices her opinion about the current social and economic conditions in San Francisco’s Mission district and DMT’s commitment to its vibrant community at the intersection of arts and politics. The CubaCaribe festival has become a way for Cuban artists, especially those who have recently immigrated to the States, to showcase their work. Ramon Ramos Alayo co-founded CubaCaribe to tap into the large talent pool represented by the significant community of Cuban and Caribbean artists who live and practice in the Bay Area. He leads by example as an immigrant who has figured out how to master our crazy capitalist system. 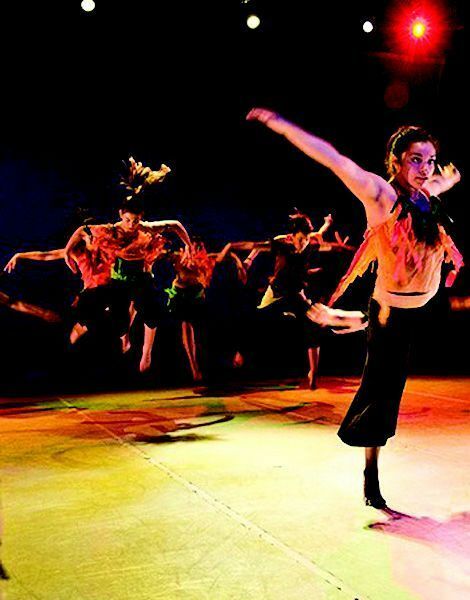 Dance Brigade went to Cuba with Ramon to perform and since then there’s been on-going dialogue between DMT and Cuba. Grrrl Brigade program is DMT’s explicitly pro-female, intensive dance/leadership development program designed to provide high quality dance training, performance opportunities, and a sense of self-empowerment to San Francisco girls, ages nine to 18. It’s a female empowerment program through dance and music. Girls are given the chance to take up space, be seen, and heard. We also work on staying affordable—art is not just for the elite. Ferrer: DMT recently became a part of Calle 24 Latino Cultural Corridor (formerly, the Lower 24th Street Merchants and Neighbors Association), which was created in 1999 by a group of long–term residents, merchants, service providers, and art organizations concerned with quality of life issues in the community. Can you tell us a little about that? Adelman: We had an ongoing conversation with the city to get the stretch of 24th Street from Mission Street to Potrero Avenue officially recognized as a historic district like North Beach, Chinatown, and Japantown—to get some leverage for funding and to draw attention to the cultural, arts, and community service organizations that exist [there] and have San Francisco recognize [them as] important cultural and city institutions. Hopefully, it will lead to some legislation in terms of how many coffee shops and restaurants can be on this street because everyone is scared about real estate and what’s going on. Dance Mission doesn’t even own its building, so we can get booted at any time. If the street is recognized, I think it will radiate out to other parts of the neighborhood. All parts of San Francisco have deep roots in Latino culture and art. California, in fact, used to be Mexico. DMT recently got involved when [Calle 24] was extended through Bartlett. This is a good first step. [There are] folks moving in who don’t put down roots. They’re here for a little bit but when they want to start a family or something they leave. Having this kind of a transient community leads to a lack of community. Dance Mission is very much involved with what’s going on in the Calle 24 community. Knowing the folks at the panadería, the corner bodega, and the different arts organizations on both personal and professional levels means that if anything happens, we will possess the power to do something about it. There’s power in the masses and we can call on each other for support when necessary. Ferrer: How has DMT’s work as a multicultural community dance and arts place impacted the greater good of the Mission? With the Mission being ground zero for gentrification culture in San Francisco, what has been your personal experience with gentrification and the development of high-end housing, upscale retail, expensive services, privatization and such, and how has it affected DMT? Adelman: I’ve seen a lot of artists and activists forced to leave, and that’s heartbreaking. Yolanda and Renee, who started Galería de la Raza, are being evicted. Dance Mission’s lease was renewed only for a year and the rent was raised. I was born and raised in San Francisco and want to have my own kids here. I have absolutely no idea if I’ll be able to do that [or] find a two-bedroom house or apartment—not on any salary I’m making. What’s super interesting, too—why is it only getting ‘cleaned up’ now when white, rich people are moving in? Everyone deserves safe neighborhoods… clean streets… good schools. Yet, they’re not given any preference until the demographics change. That’s what’s wrong. This corner—24th and Mission—has always been a movement arts space. I think in the 1920s it was a ballroom and in the ‘60s it was a boxing ring. Third Wave moved in and it became a dance studio in the ‘70s and ‘80s. We’ve been here since 1998. This space has always celebrated the movement arts. There’s a legacy to uphold. The windows are huge and when you look out, you’re connected with the community—you see the protests, hear the proselytizing, see the demonstrations. The sound of our music and drums also wafts out the windows, from Alfie Macias’ baterías to the Taiko, Haitian, and West African drums. We offer work exchange opportunities for people who want to take classes and also rent the theater out for shows. It’s amazingly affordable, so we get a lot of people who wouldn’t come in otherwise. The arts are changing in San Francisco. All this money is being put into the mid-Market area to ‘clean it up.’ It’s an area of San Francisco, like Bayview/Hunters Point or the Tenderloin, that ‘tourists won’t like.’ One of the ways to clean up is to put money into arts organizations that can move in and buy buildings, or to encourage specific organizations to do high-end projects there. A surprisingly large portion of grants for the arts goes to the symphony and to the San Francisco Ballet, while there are many other smaller, community arts organizations getting less funding. I’m always in favor of more money going towards the arts because the arts get shafted all the time, but something about this makes me uncomfortable. It’s like a top-down approach—an artificial pumping up of an area, versus looking at and investing in organizations that are already working within the community, to help them succeed and expand. Doing this would facilitate the organic nature of things and strengthen communities. That’s what makes DMT successful—its organic way of working. Our staff has either volunteered or interned first. Artists run into each other in the hallways and decide to collaborate. Our office is always open. We’ve built relationships and the artists have thrived from our support—whether by doing their publicity and writing proposals or just by providing encouragement. More than anything, DMT pushes people. We see artists and we see their potential. To have that kind of support system is invaluable. It’s organic, authentic, and really community-based.